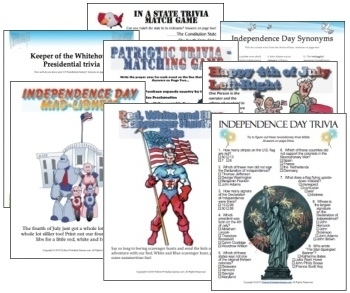 A 4th of July scavenger hunt combines education and sleuthing in one fun patriotic 4th of July game. 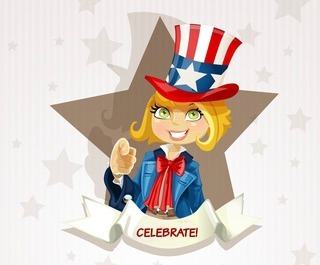 Below are several examples of scavenger hunt clues for a 4th of July party. Let them inspire you to set up your best holiday scavenger hunt ever. Print clues on white or aged paper. Roll clues into scrolls and tie each with the applicable team color ribbon. If you do choose to divide into teams you'll need to note that hunters not touch or move any other team's clues if they find them while looking for theirs. scavenger hunt of patriotic proportions. Decide on a hiding place such as a mailbox. Create a chart of Presidents and Vice Presidents, putting a letter in the word mailbox next to each Presidents' name and any other letters of the alphabet (not found in mailbox) beside the Vice Presidents' names. Hunters will need to determine who on the list are Presidents and who are Vice Presidents. They will then circle the individual letters beside the Presidents' names. Next they will unscramble those letters, and if they guessed the Presidents correctly they will find out that their next clue is in the mailbox. Of course any hiding place can be used in place of the mailbox example below. 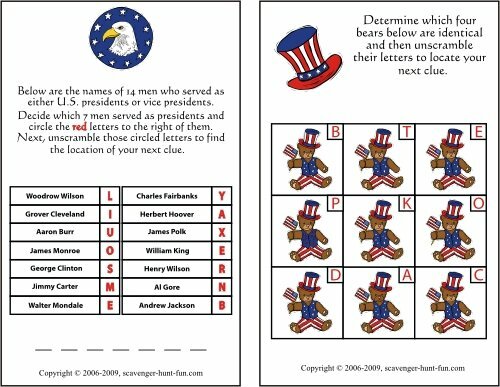 Just be sure that only Presidents names are listed beside the letters that will spell the hiding location and then no letters identical to those included in the hiding location are listed beside a Vice President. Decide on a hiding place such as a pool deck. Create a chart of nine identical pictures, each with a letter beside it. D-E-C-K should be 4 of the letters and the pictures associated with them should remain identical. For each of the other 5 letters change one small thing on each picture. Hunters will need to determine which 4 pictures are exactly the same. They will then circle the individual letters beside those pictures. Next they will unscramble those letters, and if they guessed correctly they will find out that their next clue is on or around the deck. Again, any hiding place can be used in place of the deck example below. Just be sure that the pictures associates with the letters that will spell the hiding location are identical and the other pictures each has a slight difference. 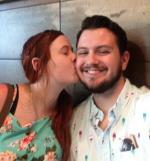 4th of July Scavenger Hunt Clue? Share it here and include as much detail as possible! Note: Please only share your own ideas. Do not copy and paste them from other websites or we will be unable to post them. Your Scavenger Hunt clue will appear on a Web page exactly the way you enter it here. You can wrap a word in square brackets to make it appear bold. For example [my clue] would show as my clue on the Web page containing your story. Do you have a picture or your clue to add? Great! Click the button and find it on your computer. Then select it.